This is NOT a real term. Instead, it is meant to sound official and medical. This is being used to scare parents and everyone out there into believing that we are being too quick to in taking teens’ expression of gender seriously. THIS IS HARMFUL PROPAGANDA! Gender dysphoria is NOT a phase or due to peer pressure! Please also be aware of terrible propaganda videos from the “American College of Pediatricians” which is a actually a conservative anti-lgbtq hate group that sounds official. It is NOT official! This is NOT the “American Academy of Pediatrics”. The American Academy of Pediatrics supports and believes in the appropriate treatment for children on the gender non-conforming and transgender spectrum. Don’t be sucked in and misled! Continue to listen to your children! Follow your heart! YOUR CHILD BEING TRANSGENDER IS NOT A RESULT OF THEM RESPONDING TO A FAD!!! This can be a matter of a life well-lived or literally death for some of our children who feel discarded and dismissed. Too many of our children are questioned and doubted when they come to us to disclose what they know: their identity is other that we assume. They are transgender. Jennifer Finney Boylan’s well written opinion piece in the New York Times is a MUST READ! Please read and pass along! This is incredibly important information! Here’s a topic that we mothers of transgender children (no matter their age) want to be reminded of, much less discuss! Suicide is frightening. And it’s, unfortunately all too real! When suicide is discussed, we are frequently reminded of the frightening statistic that states that 40% of transgender folks have attempted suicide. This two year old article does a great job of exposing the WHY behind the scary statistics that haunt us. The transgender folks that are more likely to consider and attempt suicide are those who feel rejected by their families and those who do not feel supported in their identities. THIS IS CRITICAL FOR US TO HEAR!! Because it is common that our transgender children and family members face social discrimination in housing, employment, and in access to health care, we need to understand that these lack of protections put our transgender family members at at further risk. Additionally, when transgender individuals do not “pass” and are instead identified as trans, they are more likely to attempt suicide than those that take hormones, have surgery and can behave and be accepted as any other individual in the community. We need to embrace our children completely- their identities ARE our children! Remember to tell your child that you love and appreciate them- tell them TODAY!! These are (again) times that are potentially frightening and even more dangerous for our transgender children and family members! Their existence cannot be discounted or erased!! Allowing the current administration to continue unchecked, will do just that! We DESPERATELY NEED representatives that will represent our collective voices!! PLEASE VOTE THIS TUESDAY! MAKE YOUR DESIRES FOR EQUALITY HEARD!!! Here is the proof that the world needs to heed…This is what our communities need to hear…NOT the small-minded dismissal of our children!! Over 1,600 scientists condemn Trump transgender proposal! This NEW BOOK looks amazing! 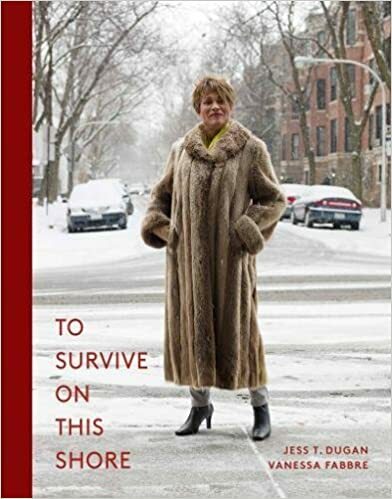 I love photography, so I really am looking forward to the portraits and interviews with older transgender people in this new book! To Survive on This Shore, by photographer and author Jess T. Dugan and social worker and author Vanessa Fabbre, spent five years traveling to bring us an important narrative that is not often reported upon. We typically read about young transgender individuals and their challenges coming out. In To Survive on This Shore, we will be introduced to older transgender and gender-variant people living their lives authentically and sharing their feelings about their journeys. The new book will be in stock from Amazon on September 11, 2018. This is an example of the sad reality of the backsliding this Administration has caused by rescinding the right for our children to use the bathroom of the gender for which they identify. Watching this is painful…yet, NECESSARY! We need to be diligent in ensuring laws are changed!! Let your elected representatives know you are outraged! After watching, ask yourself: How would have these community members and school administration handled this if she had actually used the boy’s bathroom as they demanded? I believe you will agree with me that after meeting this GIRL, you KNOW that requiring anyone to use the bathroom that matches physical body parts is NOT appropriate or safe! Wonderful Journals! For You AND your Kid’s Journeys! I think often about how support is available these days for parents and their children that struggle with different issues, like Autism or Diabetes. There is certainly much more available to read concerning parenting a transgender child and more parent support groups now than there were 7 years ago when I began my journey as a mother of a transgender kid. But, MORE resources are still needed! I am delighted to share a NEW resource that will serve to inspire, keep you grounded, and lighten the journey! My Parenting Journey with a Transgender Child: A Journal and Wonderfully and Purposely Made: I am Enough, A Journal All About Me, are written with you and your child in mind! Author Cheryl B Evans has designed these journals with the goal “to bring peace, light and affirming messages to transgender people and their families”. Cheryl told me that journals made a huge impact on her in the months and years after her (then) daughter revealed to her that she was transgender. I also found that journaling helped focus my crazed thoughts and worries after my son came out to me! Journaling is something that I often recommend as it helps us focus and give purpose to our thinking. It gives us control at a time when we can frequently feel OUT of control! Unlike the blank pages that Cheryl and I had to look at while finding inspiration, Cheryl’s journals are filled with thought-provoking prompts, quotes and affirmations, and even drawings to color (talk about calming!!). I found many of the pages really helpful, such as “Practicing a Healthy Mind”, “Considering Family Members”, and “Ways to Focus on Gratitude”. Cheryl is able to offer us authentic guidance for our journaling because she has walked our walk herself! I love Cheryl’s idea of a separate and specific journal for our kids. I am Enough provides a positive direction for our children. The chapters include, “Who I am”, “Happiness and Joy”, “Dreams and Goals”, and “Health”. Again, there are spaces provided in which to artfully create. Click on the links below to purchase these terrific books! HAPPY JOURNALING!! IT WILL DO YOUR HEART GOOD!!!! Great Event !! It can be difficult to find positive opportunities for our young ones! Check this out!! Click Below: RAINBOW SUMMER FESTIVAL this Saturday, August 11, 2018 at the LA LGBT center. I love reading about trans folks in other countries. It seems to be easy to find news about the struggles for trans-acceptance and safety, so I always enjoy reading about how folks push past the struggle and enjoy life!